See also the layperson's introduction: Jumping frogs, squeaking bats and tapping woodpeckers. Have you ever dropped a wedding ring on a hard stone floor? If you have, you probably noticed that it can ring like a bell. And it doesn't matter whether the ring is big or small. Here is an artistic rendering of a nanoring and electron microscope images of the sample. Our nanorings are only 120 nanometres in diameter, and are fixed to a glass plate. We hit them with a short laser pulse and watch them vibrate using another laser pulse. The rings vibrate at very high frequencies, around 10 GHz (=1010 cycles/s), too high a pitch for you to hear. This is a graph of the observed vibrations, tiny variations in the optical reflection coefficient. Red: experiment, blue: fitted. Patterns of vibration of gold nanorings modelled at different frequencies. To animate click the image (230 kb movie). The way the ring motion is generated and detected depends on the coupling of light and electrons in the ring, known as surface plasmons. We hope that the details of the plasmonic coupling can be worked out in future. 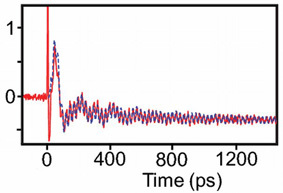 For more details, see 'Ultrafast vibrations of gold nanorings,' T. A. Kelf et al., Nano Lett. 11, 3893, 2011.